National news sources may broadcast stories of Central and South American drug cartels that are flooding the United States with cheap cocaine and crystal meth, or on Asian drug lords that are financing territorial wars by selling heroin to U.S. addicts. As bad as these problems may be, they are increasingly dwarfed by the number of Americans who are addicted to prescription drugs that they legally purchase from their physicians and pharmacies. A prescription drug addiction may begin with something as benign as your doctor’s giving you a prescription for an opioid painkiller like Oxycodone following a surgical procedure or as treatment for a chronic injury. You might understand that this prescription drug is addictive, but you place trust in your doctor not to give you anything that does more harm than good. Before long, however, you find that you need greater and more frequent doses of the painkiller to get the same result, and that you are unable to wean yourself from the drug even after you are pain-free. 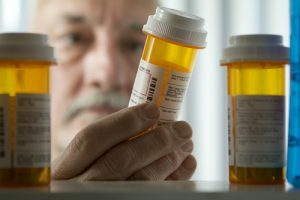 Research on prescription drug addiction suggests that people either downplay or don’t understand the addiction risks associated with many prescription drugs. People might give prescription painkillers to family members, not realizing the dangers of what they’re doing. As prescription painkillers have become more readily available, people who don’t use their entire prescribed amounts frequently share leftover pills with friends or relatives. Increasingly savvy teens have also been known to search for pharmaceuticals in their parents’ medicine chests. It would not be an understatement to call America’s prescription drug abuse an epidemic. By some estimates, almost ten million people in the United States are addicted to prescription medications. If you suspect that you are one of those people, your first action should be to consult with the physician who initially prescribed the medication for you. Describe your symptoms and your concerns and ask if you should begin a treatment program. Do not attempt to stop taking your medications without medical oversight. Sudden withdrawal from an addictive medication can be dangerous and may cause even more significant health problems. Your doctor may start your recovery by reducing your dosage or the frequency of administration of the drug. If your addiction is severe, your doctor may admit you to a medical facility or hospital for monitoring or for treatment with alternative medications that can reduce any withdrawal symptoms. You will likely need some ongoing behavioral therapy to avoid relapses. The federal government has enacted a few programs to monitor prescription drug abuse, and physicians are increasingly aware of the risk and dangers of prescribing potentially addictive drugs to their patients. Nonetheless, you can still find yourself with an addiction problem that you never anticipated from a drug that was legally and legitimately prescribed for you by your physician. If this does happen and you need information on where to turn, the staff at Hired Power can answer your questions and guide you in the right direction. Please contact us at 800-910-9299 for more information.